Check out "Electronic Voting Machine Spoof" at Cynical-C Blog. This doesn't help my already suspicious view of electronic voting machines, but it sure is amusing. 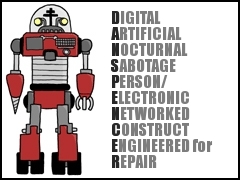 Goldie, at Drama Queen, provides the link to the Cyborg Name Generator. The Generator will provide you with your cyborg name and a personalized graphic. It's one of those silly time wasters I can't resist.